Carole Collet kindly invited me to show the Thought Harvester and the Plasmorph at her recent initiative Big Data: Designing with the Materials of Life at the Lethaby Gallery. The exhibition is curated in two parallel formats. 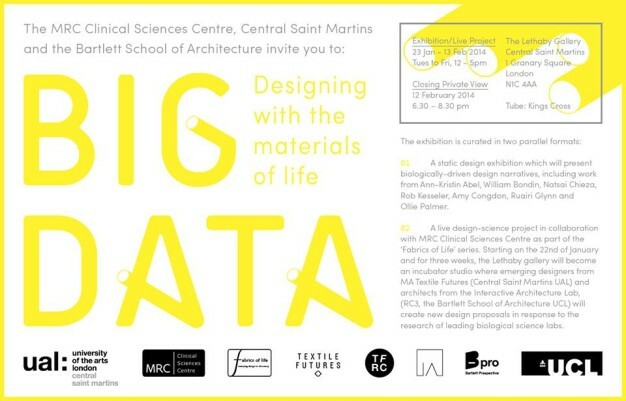 A live design-science project in collaboration with the Medical Research Council as part of the ‘Fabrics of Life’ series. For three weeks, the Lethaby gallery becomes an incubator studio where emerging designers and architects will create new design proposals in response to the research of leading biological science labs. An online catalogue featuring content of the exhibition will follow soon.